"They had no warning, they were unarmed. Now the wildmen are moving through the westfold, burning as they go." The Stinging Nettle has more uses for a Ranger in the wilds than just making delicious soup! 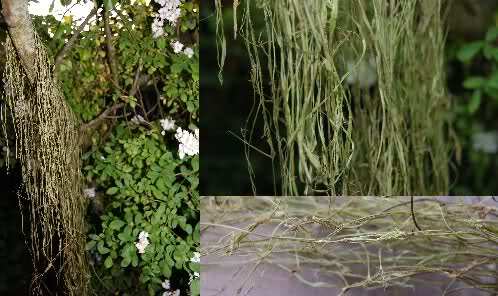 One of these is Nettle string. Making your own string or cord could be a vital skill in the wilderness, where it could be used to hold up your shelter, hanging up equipment, or for sewing and mending clothes, maybe just for decorative purposes. It’s also just really fun to do, and strangely relaxing! 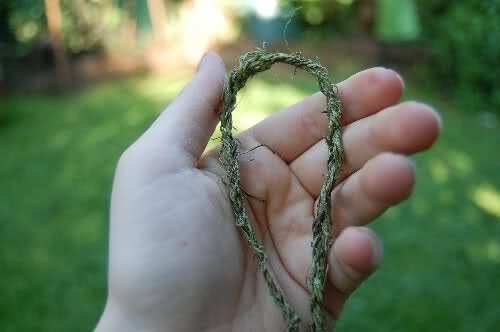 Nettle string is surprisingly strong, and you can make it as long or short, thick or thin as you want. So, how do you make it? Firstly, before you begin, here are some easy to find (except the gloves though these are optional) tools which you will need. Step 1. Find a local Nettle patch, or some in your own or a friends garden. Remember to get permission before you cut them, though most people don’t mind as they don’t know how useful the Nettles really are! 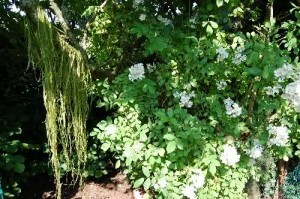 Firstly, you will need to cut about 20 Nettles (This will make quite a lot of string, you could start with a few less). These need to be as big as possible – don’t bother with the little ones, but most importantly thick with green stems (not woody, Nettle String is made out of the ‘skin’ not the inner pith). Hopefully, if it’s a big patch, you should find plenty of these after a bit of searching. MAKE SURE that if you use a cutting blade you wipe it off straight after, as after a few minutes a nasty brown substance starts appearing, and it doesn’t come off once it’s dried! It’s probably sensible to wear a pair of gardening Gloves when you gather the Nettles, but if you don’t have them, or just manage to get stung anyway, you will need to treat it with Dock leaf juice immediately – this stops the sting, and mostly stops it appearing at all! 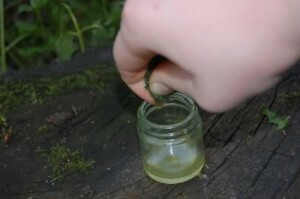 The juice seems to work better fresh, but for the purpose of showing you how to use the leaf, I’ve used a jar to collect it in. 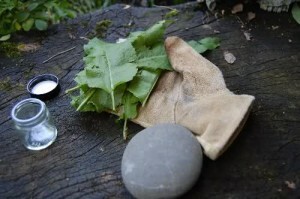 Take a few Dock leaves in your hand, tear them up a few times, and roll them hard between your palms, until you begin to see a kind of green ‘juice’ appear. Then simply squeeze onto the affected area. Try to get a good few drops on top. Leave it for about a minute, and you should suddenly notice any pain gone! Don’t be put off yet though! If you wear your gloves and wipe your blade, all will be well! To see what you do with your Nettles now, go to page 2. So, you’ve cut your Nettles, but what now? 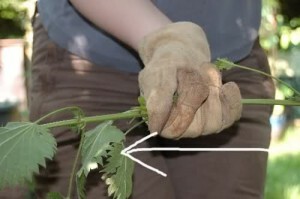 Holding the Nettle firmly by its base and, grasping (quite tightly) the stem with your other hand, pull your hand all the way up the stem in one movement (see picture). Make sure you are running your hand from the bottom to the top of the nettle! This should not only remove most of the leaves, but also crushes flat the little spines on the stem which cause that to sting. You may want to do this a couple of times on each nettle, just to make sure the sting is gone. Pick off any remaining leaves, and your Nettle is safe to work in your bare hands! Repeat this with your other Nettles. 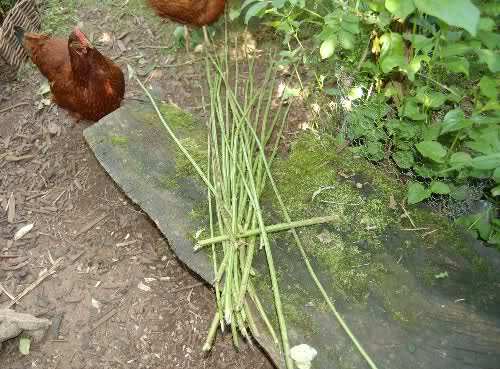 You now have a pile of harmless Nettle Stems. Well done! Now the fun part begins. Taking your trusty Stone, and working on one Nettle at a time, crush the stem flat, all the way up. Don’t get too carried away though, as remember it is the outer skin of the Nettle which will be used as the String fibers. The outer skin should now come away from the pith quite easily, and you can peel it away like a banana! Don’t worry about it not coming off in one piece, as you will need to split the strips you have into even smaller strips, about half a centimeter across; however, you will need to be careful to keep the strips as long as possible, as this will make the last stage much easier. 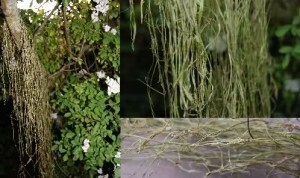 You’ll now have a nice bundle of wet nettle fibers, so to dry them out, simply hang them from a handy tree branch, or whatever is available, hope for good weather, and leave to dry over night. Congratulations! This is the final stage in making your own Nettle String! Hopefully, your fibers will now be nice and dry, and you’re ready to start rolling! Take one fiber. Fold it in half. 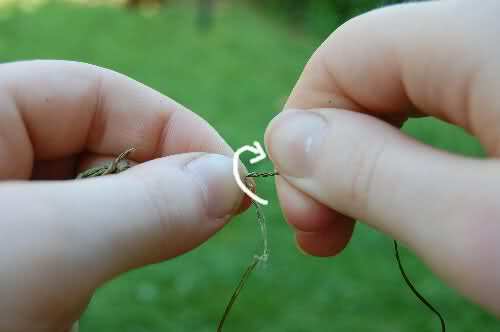 Hold the ‘fold’ In your thumb and finger, then roll it with the fingers of your other hand. Keep doing this on a short length until it kinks. It will look as though there are two fibers rolled together. Now, you need to add a third fiber. 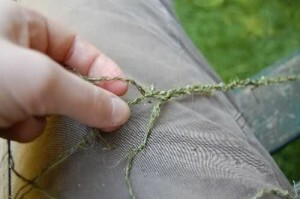 To make the string, take the top two fibers, and give them a twist together. Then move them round behind the other fiber, so that they are now below it. Then, you just take the top two fibers again, roll etc etc. If you can’t easily tell which are the top two fibers, you’ve been a bit too enthusiastic with your rolling! Just unroll and try that step again. Continue with this to make your length of string. When you run out of a fiber, just put another one on top, and count them as one. When you’ve finished, just tie a knot, and trim the ends off. You can if you wish also trim off the ends of where you joined other fibers on, but be very careful not to cut too close to the main cord. You will now have a thin fiber. If this is what you want, (for example if you are using it for decorative sewing) you can stop here, but otherwise if you want to make a bigger and stronger cord, you can join several together. There are all sorts of interesting types of weaving you can use, but for this example, I used a simple plait. You can of course then go on to create even larger thicker cord again, though this is what I find the most useful size. It is surprising just how strong this string actually is, if you’ve done it well, you shouldn’t be able to break it, so it’s great for around the camp. If you leave it out in the rain, it will have a limited lifespan of probably around a few weeks, but if you keep it dry, it can last for years!